Pre performance, I found Faith in a powder blue room in the basement labyrinth of Trinity St. Paul's. She was setting up a tray of cold cuts and cheese hunks for the gathering that would happen after the show. Right off the bat she is high energy. Quick on her feet. She moves. She talks. She laughs. She jokes. She hugs. She bobs. She weaves. She's in your face, but in a nice way. In another life she'd have made a pretty good light weight. But in this life she's a still a fighter. She fights for social justice. Her sympathies are always with the underdog, the outsider. This has to do with coming out of the Afro Scotian experience of Africville, growing up poor, and being a Queer black woman. It makes sense that she has helped bring out music that's about inclusion, acceptance, and respect. Faith Nolan and the Elementary Teachers of Toronto entered the rented room where they would performance some songs from their new CD at the same time as the audience. There seemed absolutely no separation between audience and performers. Faith, the teachers, and accompanying musicians, wore dark green tee shirts over their civilian clothes. They took their place on a low rise stage at the front of the room. 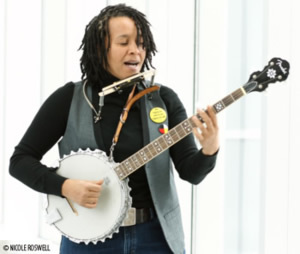 Carrying a banjo, Faith kibbitzed with the small admiring audience like the long time performer that she is. The teachers, almost all women, lined up, each clutching their songs, faced the audience ready to perform selections from the CD. Before each song a teacher stepped forward to read a short note giving some cultural context. These sincere and unaffected words made me think of kids making book reports in front of their class. Once the teachers launched into the songs proper with Faith's guidance, I had the feeling that I was witnessing something from another era - a time when the people sang and not just professional musicians! This was music performed by the people, music of the folk, unpolished yet nourishing. Also, there was a performance of four affecting songs - two of which were Honour Songs that you have to stand for - by an Anishnabi woman named Zainab Amadany who was accompanied by two friends one Hazem Jamjoum and the other Magaly San Martin a Chilean. President of the Elementary Teachers of Toronto Martin Long said, "I'm happy to see the progress of the choir. They really worked hard. Teachers will use these songs in their classes. Faith did a good job with them. I think I first saw Faith perform at International Day for the End of Discrimination and also at a Labour Day celebration for the Status of Women. She's a great musician with a progressive way of thinking." "Don't you believe in freedom?" Faith asked a member of the audience. Its clear that she does.